Happy Thursday boys and girls. I can’t believe that today is the last day of July. It is crazy when you realize how fast the year has gone by. Okay, enough reminiscing, it is time for Shop Shots! This may not look like something out of the ordinary, but it is. 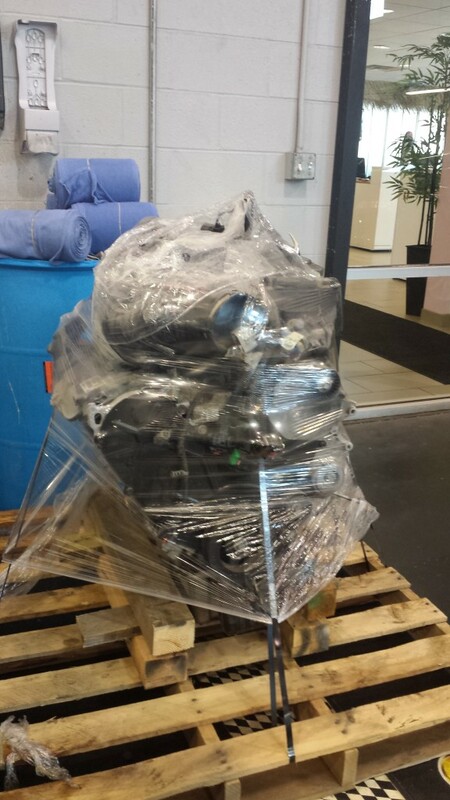 This engine was delivered to us a few days ago. When they took it off the truck I was shocked. Shocked because I had no idea what the heck type of engine it was. I have seen plenty of VW engines, and this didn’t look anything like that. That is because it is NOT a VW engine. It is for a dang Routan. I got some of the story on why we are replacing a Routan engine with a junkyard engine. It seems that a customer drove through water high enough to pull water into the engine. I don’t know why people do that. It should be interesting to see this Routan get an engine replacement. I will keep everyone updated when the repair is done. Maybe there will be some cool pictures of the damage. This is a much less rare thing. You are looking at a B7 Passat VR6. This car had some type fault for a Knock sensor. There is a Tech Tip, or a TSB for this issue. The repair is replacing the engine room harness. There are probably about 30 connectors on that harness. 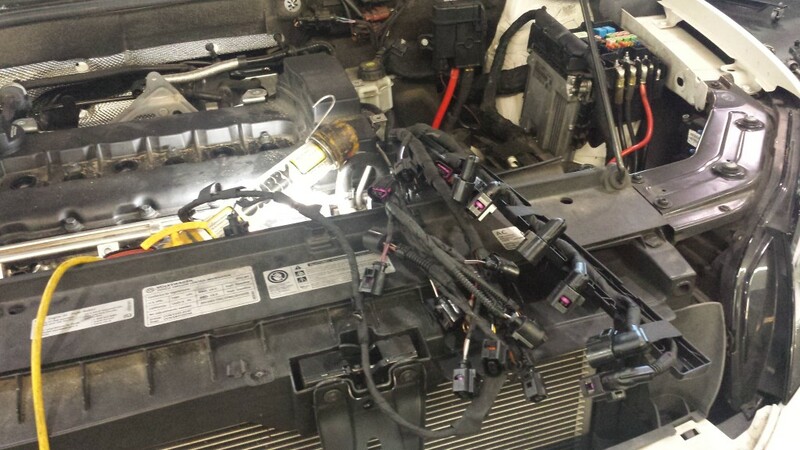 Replacing an engine harness can be a big task depending on the engine. I talked to the tech working on this car, he said it was one of the easier ones. This last one is a good one. This is a steering knuckle from a Touareg. The holes are where the brake caliper bolts on. One of the techs in the shop was replacing the brakes on this Touareg. When he put the bolts back in, the threads got damaged. We retapped the hole, and cleaned up the bolts. Even after that the job went sideways and ruined the treads. Replacing the knuckle is expensive, and the machine shop didn’t have a heli-coil that size. The solution for this comes in the form of a Time Sert. These things are amazing. You basically drill a bigger hole, and thread a sleeve into the hole. 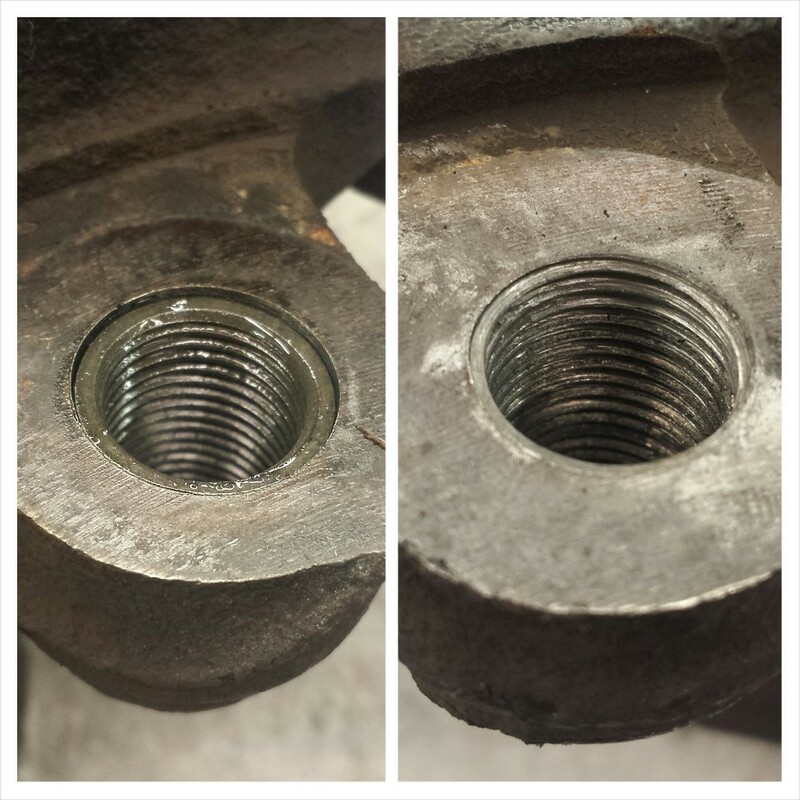 The picture on the left is the repaired bolt hole, the one on the right is the good one. It is a great solution for a job that goes bad. That does it for another volume of Shop Shots. As always I hope you have enjoyed the pictures and little stories behind them. The Time Sert looks pretty cool. The Routan was an odd one, a Chrysler with a VW badge. Usually it was Chrysler/Ford/GM slapping their name on someone else’s stuff. Hey good job on the stripped threads! I always hated that part of the day having to take time and redo the threads. Wow that TimeSert thing is slick! I watched a bunch of those videos on the page after the jump — that self-locking feature is pretty ingenious. I feel like there’s a lot of situations where something like that could be a lifesaver. really like the idea of the TimeSert, very cool!